Due to its attractive form, the Freshmushrooms B+ is one of the most popular species to grow. The B+ is a much less pronounced strain. 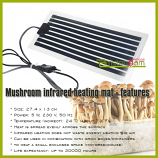 It will ensure that you will feel upbeat and positive for hours. Of course this depends on the quantity and your state of mind. 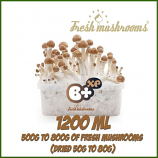 Due to the quality of the active substance content, the Freshmushrooms B+ is considerably stronger in effect than many other traditional B+ grow kits that are available.